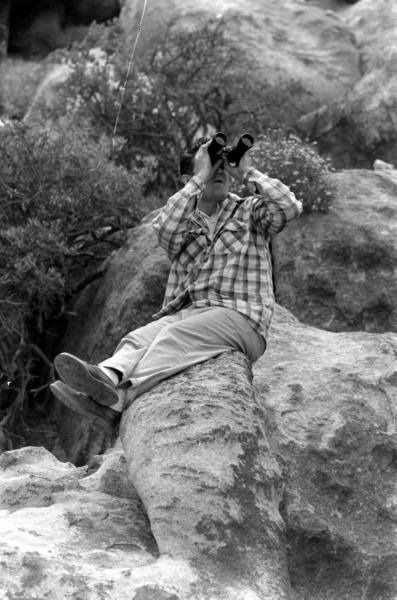 According to George Van Tassel at THE GIANT ROCK UFO CONTACT was made--- that led to UFO shindigs being held at this location. 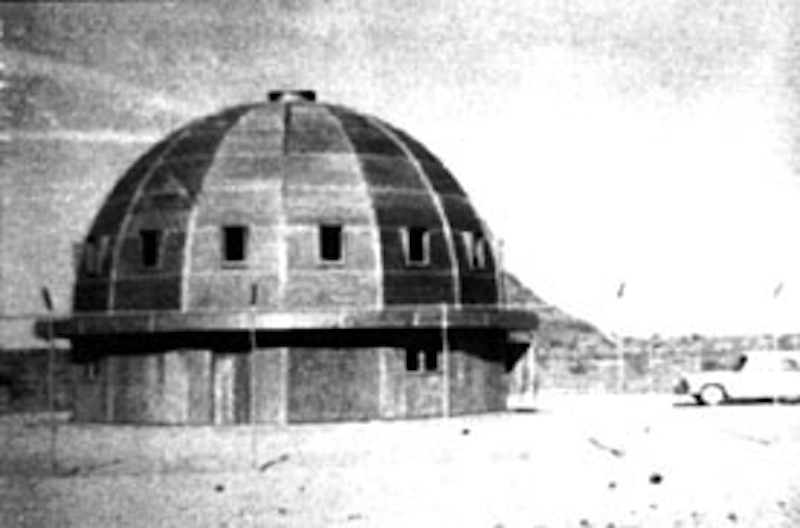 On the night of August 24, 1953 at the GIANT ROCK UFO CONTACT was made or so claims George Van Tassel. A Venusian from a scout ship, talked to Van Tassell at length about energy and other mysteries. 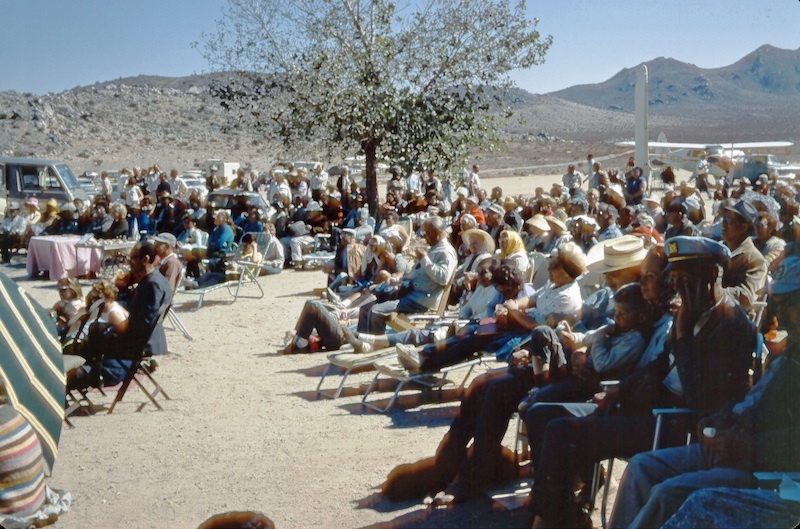 From this Giant ROCK UFO CONTACT, or alien meeting, Van Tassel began hosting yearly UFO conventions at his desert airfield. 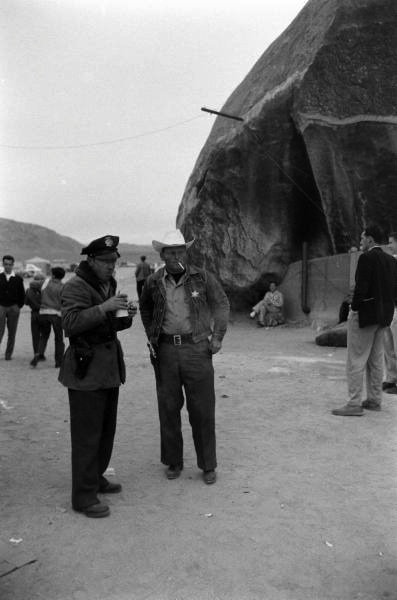 From this GIANT ROCK UFO CONTACT -- Van Tassel began running an annual UFO convention at his desert air strip. 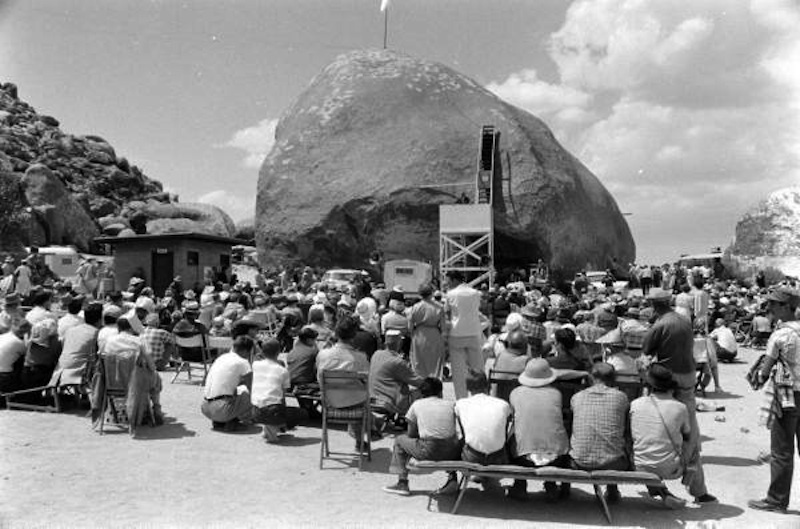 From 1954-1977 the Giant Rock would annually become a place where UFOLOGY was presented by way of speakers and spectators. 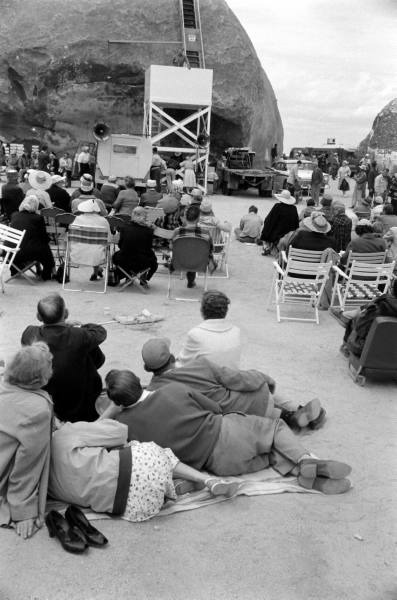 The Giant Rock shindigs became the "WOODSTOCK" of UFOLOGY. 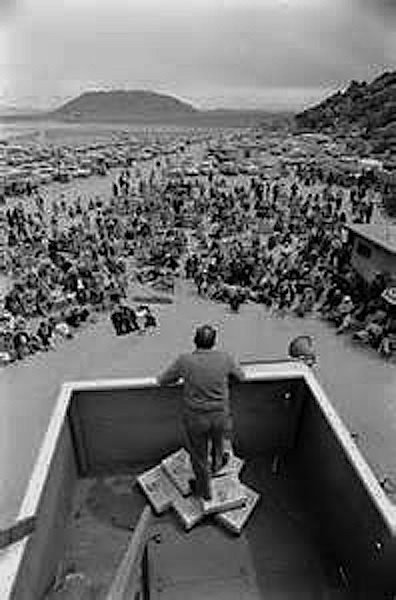 Speakers, contactees, spectators, grifters, searchers, UFOLOGISTS, capitalists, would drive to or fly to the Giant Rock UFO convention. 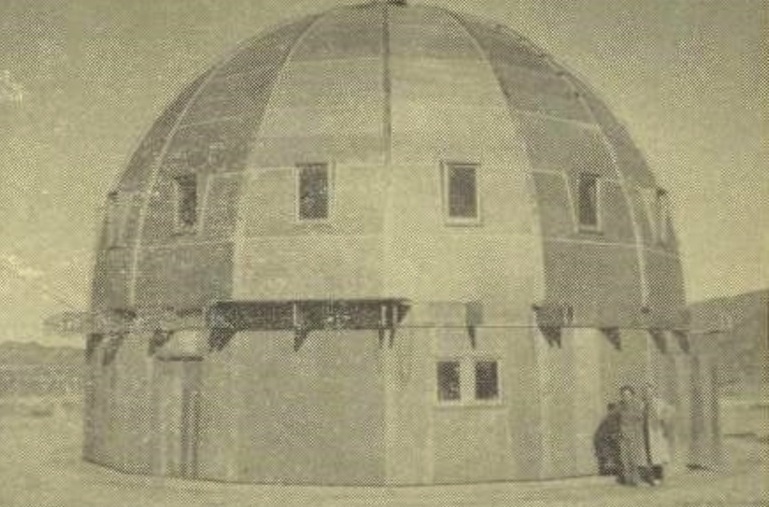 Van Tassel attested that the Giant Rock UFO Contact ship was from Venus, it was a small scout craft. The extra terrestrial that talked to him, was named Solganda, who looked around 28 years old but was 700 years in age. The Venusian looked NORDIC and his English was perfect, the being's voice sounded like actor -RONALD COLEMAN. 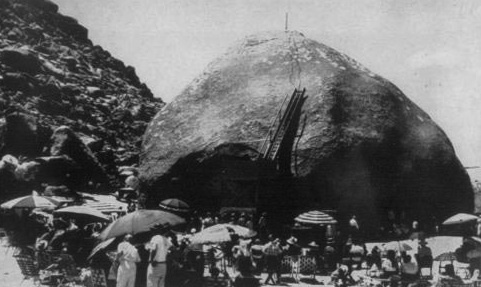 At first the Giant Rock UFO Contact conventions or THE GIANT ROCK SPACECRAFT CONVENTIONS were very primitive affairs. Speakers at ground level with a microphone would address the crowd. Then a tower was built with a speaker, then more speakers were added to the tower. Finally a roof top for shade was built atop the tower. 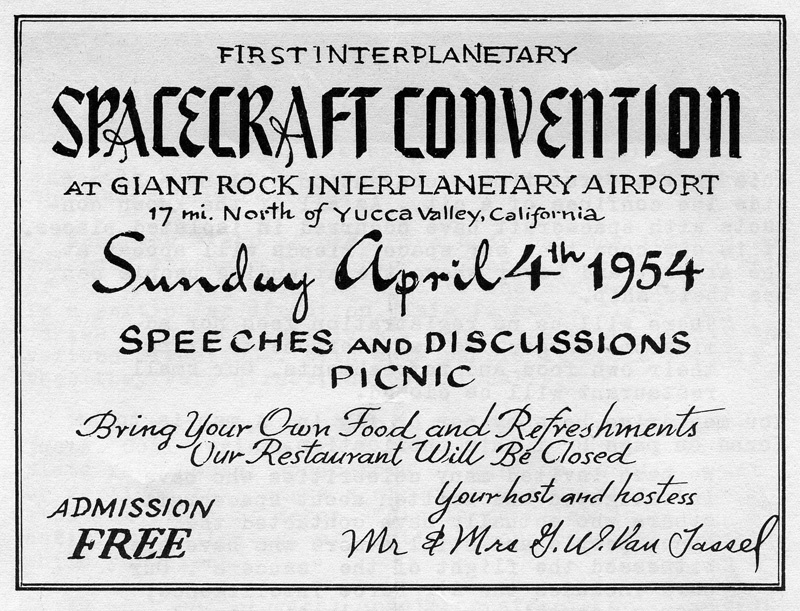 Out in the middle of the Mojave at the Giant Rock which at one time was 30 miles from the nearest paved road, this odd UFO convention was held. Below right: I have no idea what happened on NOV 7, as for the year this picture was taken--unknown. 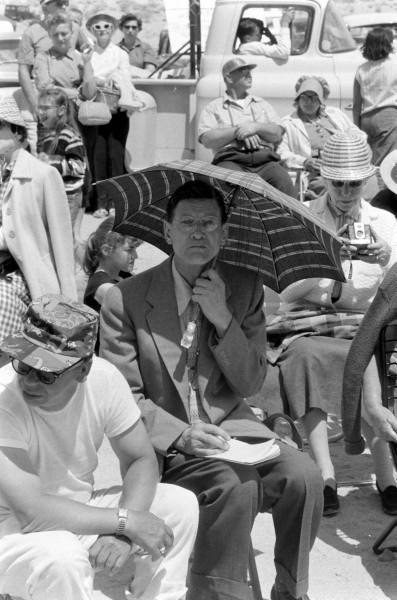 All types of people showed up at the Giant Rock Flying Saucer meetings. 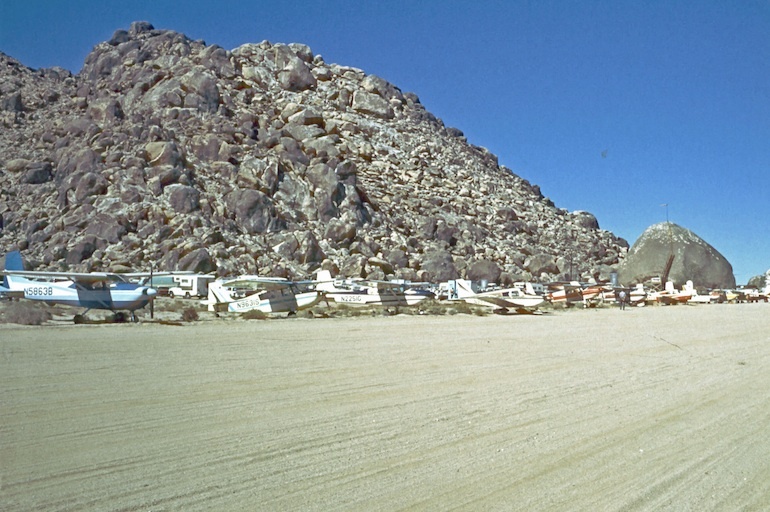 The sincere, partiers, the lost, the naive, merchants, seekers, you name it, they were there at the GIANT ROCK, which is about 41 miles north of Palm Springs, California. 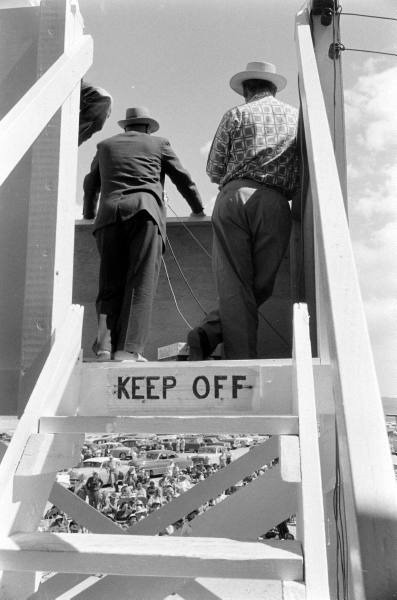 RIGHT & BELOW: George Van Tassel died before the contraption was completed. 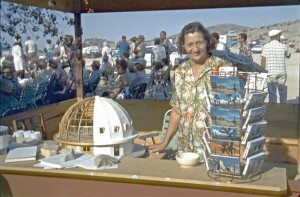 Left: Eva Van Tassel, wife of George, at her booth. 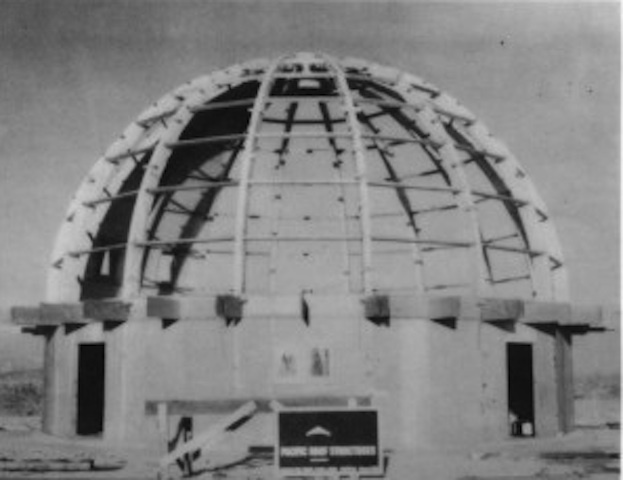 The model is the Integratron. This machine/house was revolutionary. 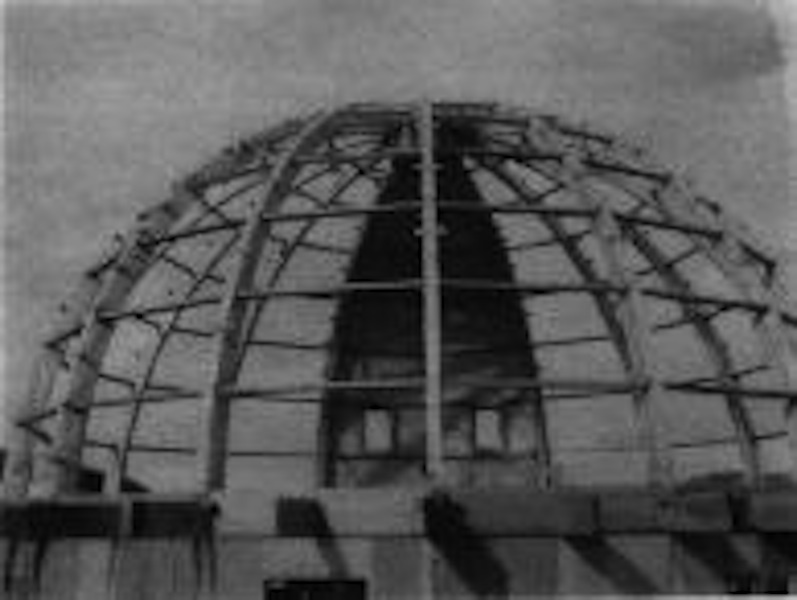 An electric field would flow through the structure and those inside would be re-energized. The technology was given to Geroge Van Tassel by the Venusians. The machine was also thought to be a time tunnel when fully operational. The concept of this machine is fascinating, electricity is still a mystery in many ways. Maybe a certain type of current can rejuvenate the human body? 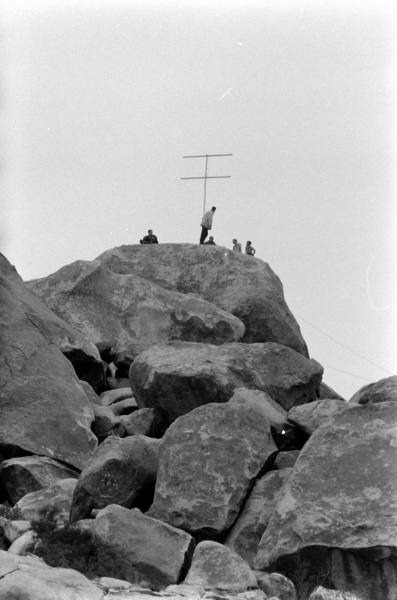 BELOW LEFT: a short wave radio antenna put ufp for the the GIANT ROCK UFO CONTACT show? 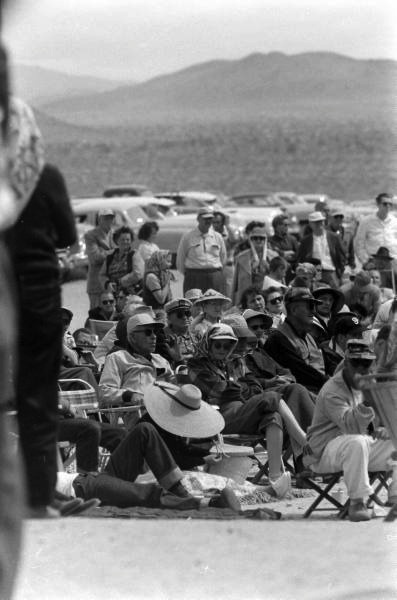 BELOW RIGHT: Taking a break from patrol duty, the Giant Rock UFO CONTACT events in the beginning were mild events, later on in the 1970s fights did break out amongst the crowd. More that likely due to the crowd components of that decade, the fights were the result of drugs and booze. LEFT: That is not a photo shop picture, it is legit. 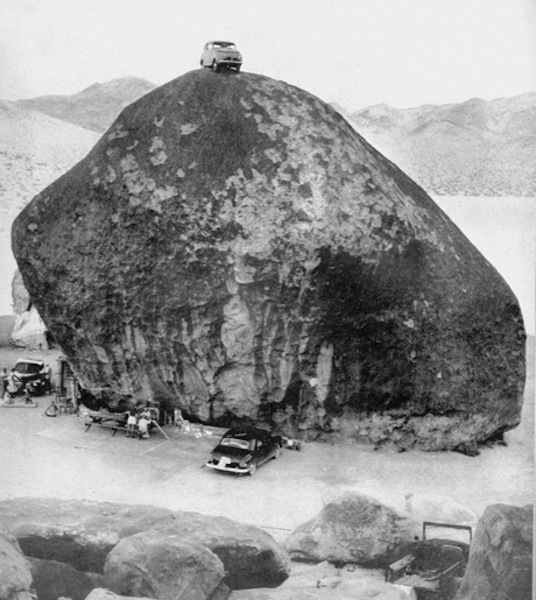 No, the car was not put on the rock by aliens. 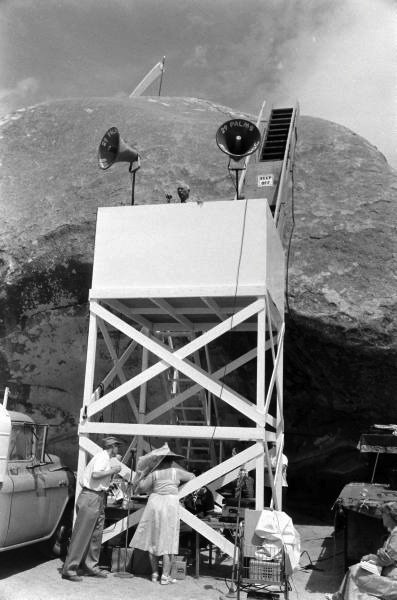 A hoist lifted the car up there, circa 1957. 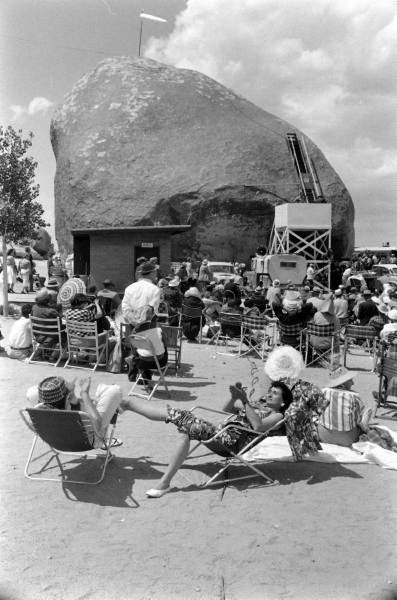 THE GIANT ROCK UFO CONTACT--shindig! 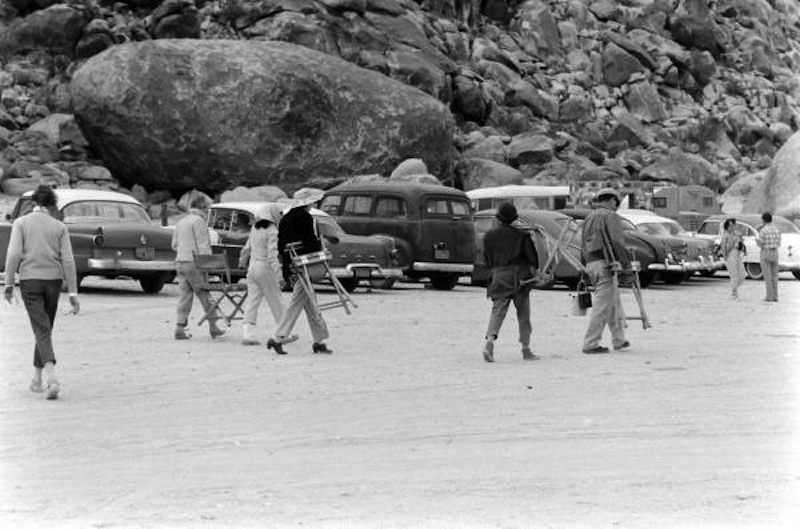 BELOW: End of the show, headed for their cars or are the going to the GIANT ROCK area to grab a spot? 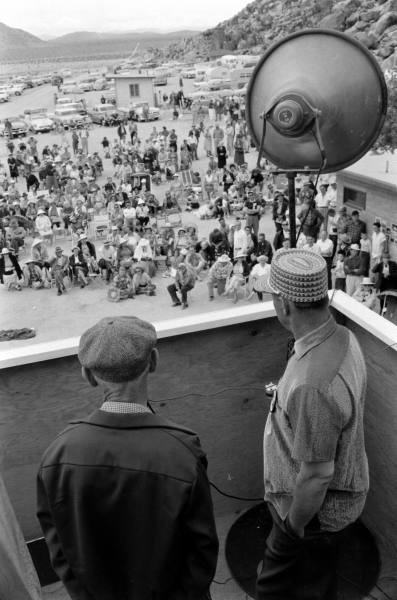 RIGHT: ABOVE THE TOWER SPEAKER IS THE AIRPORT WIND SOCK, SOME PEOPLE THOUGHT IT WAS A ODD INDIAN FEATHER THAT THE MAN WAS SPORTING. 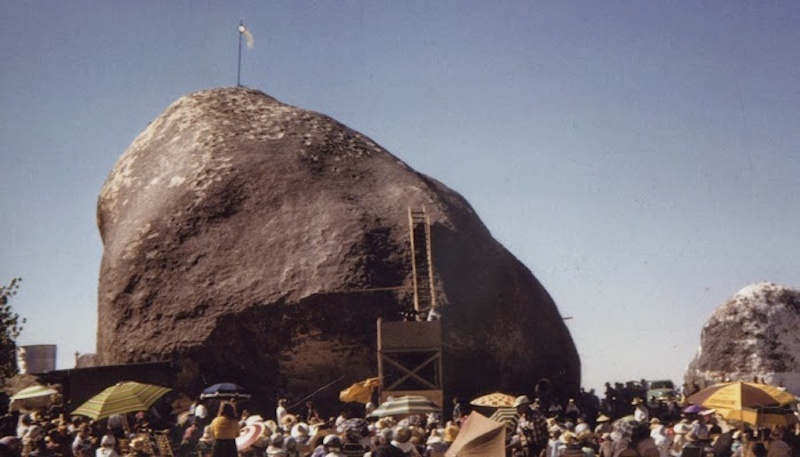 ABOVE & BELOW: People came to learn, unfortunately there is not much audio or film that has been found concerning these annual GIANT ROCK UFO CONTACT happenings. 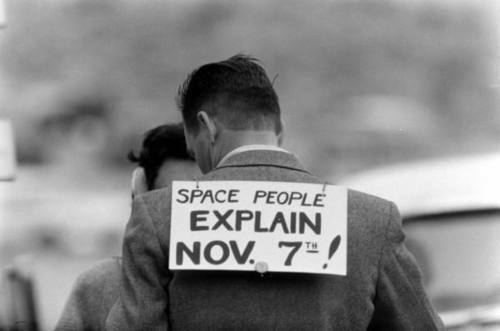 ABOVE PHOTO: is supposedly from 1968. 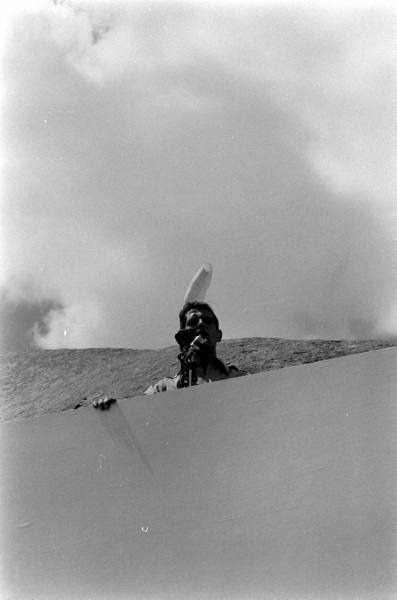 I do not think so, in 1968 the tower had a roof on it, this photo is circa 1966?